Moscow and Beijing share a similar stance on the implementation of the US-made Terminal High Altitude Area Defense (THAAD) complex in the Republic of Korea (ROK), paving the way for further Sino-Russian military cooperation in the region, experts told Sputnik, explaining why the THAAD deployment has nothing to do with South Korea's defense. Russia's position of the deployment of the US' THAAD system in South Korea serves China's interests, Da Zhigang, director of the Institute of Northeast Asia under the Heilongjiang Provincial Academy of Social Sciences, told Sputnik, stressing that Moscow and Beijing opposed Washington's plan from the outset. "The Russian Foreign Ministry stated clearly that this step is aimed against China and Russia, expressing a common position with [Beijing]," Da told Sputnik China. "It would be natural if the countries take joint countermeasures [against the deployment]. In this regard, China and Russia can bolster cooperation in political, diplomatic, economic and military spheres." Da believes that the countries need to forge a consensus regarding the challenge posed by THAAD, while developing further cooperation and preventing the threat from the alliance of the US, Japan and South Korea. Speaking to Sputnik on Wednesday, Georgiy Borisenko, Director of the North America Department at the Russian Foreign Ministry, outlined that America's THAAD missile defense systems in South Korea target Russia and China in the first place. Borisenko highlighted that given the system's technical characteristics and striking range it is merely incapable of preventing the Democratic Republic of Korea's retaliation attack: THAAD wouldn't be able to intercept artillery shells used by Pyongyang against its southern neighbor in case of a military conflict. Commenting on Borisenko's remark, Russian military expert Vladimir Evseev, the deputy head of the Institute of CIS countries, noted that the aforementioned US-made systems may intercept rocket heads at the terminal part of trajectory at an altitude of about 150 kilometers (93.2 mi). According to Evseev, the crux of problem lies in the location of this system on South Korea's territory: Actually, it doesn't provide protection for Seoul, being most likely intended for the protection of the US troops and military facilities on the peninsula. Thus, the THAAD deployment in the Republic of Korea (ROK) has nothing to do this its defense, he stressed. However, at the same time the implementation of the US missile defense system on the peninsula poses a significant challenge to China, Evseev said, explaining that the THAAD complex includes the X-band AN/TPY-2 radars which have a range of more than 1,500 km (932 mi). This would be enough to keep an eye on China's bases where medium-range ballistic missiles are located, he noted. "It's not THAAD itself that poses a threat to China, but its information system," the expert told Sputnik. "The launch of Chinese medium-range missiles will be detected by the THAAD radar system. And the data will be immediately transferred to the United States." Evseev called attention to Beijing's determination to thwart the US plan: one of the recent large-scale war games conducted by the People's Liberation Army (PLA) was aimed at overcoming THAAD. The expert assumed that the THAAD issue would also be raised during the upcoming 19th National Congress of the Communist Party of China which is due to take place on October 18 in Beijing. "In particular, [the congress] may mull over taking military-technical measures to overcome this challenge," Evseev surmised. Da shares a similar stance, stressing that Beijing has to boost its military potential to contain the threat in the long run. At the same time, he drew attention to decreasing trade and tourist exchanges between China and South Korea. Da noted that it's not Beijing's measures but the reaction of the Chinese society to the ongoing political tension. He also believes that Beijing should attract worldwide attention to the problem to win international support. 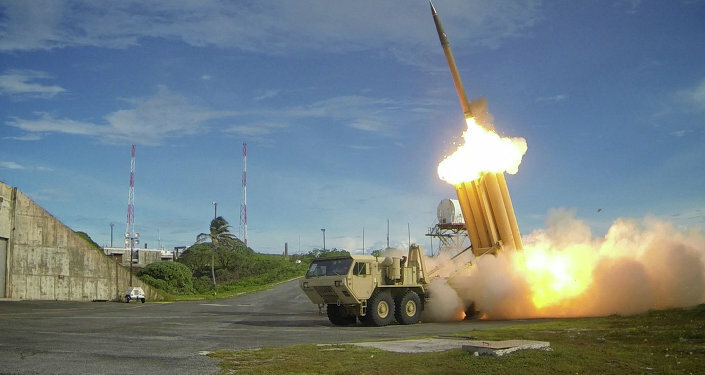 Meanwhile, Seoul made it clear that it will install the four remaining THAAD launchers, amid increased North Korean missile tests and Pyongyang's reported try-out of a hydrogen bomb that could be loaded on an intercontinental ballistic missile in early September. In response, the Chinese Defense Ministry has yet again urged Seoul to abandon its plans, citing security concerns. "The deployment of the Terminal High Altitude Area Defense systems to the Republic of Korea is a serious blow to the strategic interests of China, Russia and other countries," the ministry's spokesperson, Lt. Gen. Zhou Shangping, said. The statement was announced by the ministry following the Russian-Chinese military meeting on THAAD on the sidelines of the UN General Assembly's First Committee. 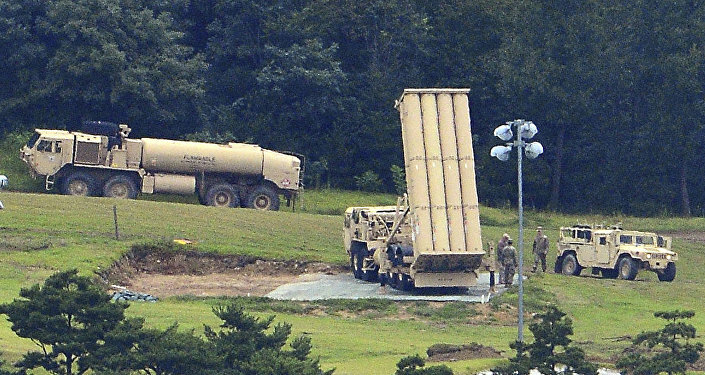 In early September, Deputy Foreign Minister Sergey Ryabkov warned that the deployment of the THAAD system in South Korea may prompt countermeasures from Moscow. Speaking to Sputnik on September 9, Alexey Podberezkin, head of the Center for Military and Political Studies with the Moscow State Institute of International Relations, suggested that Russia's Iskander mobile short-range ballistic missile system as well as Kalibr cruise missiles could become a response to the US-made THAAD missile defense system on the Korean peninsula.